A Sussex friend brought me here after a ramble around St Leonard's and an agreeable meal in a congenial country pub. I think John "Mad Jack" Fuller, 19th-century squire of Brightling, had had more to drink than we did when he made a bet with a friend that he could see the spire of Dallington church from his lawn. On arriving home and finding he couldn't see the church at all, he hastily had this false spire built – allegedly in 24 hours – to change the view, fool his friend, and win the wager. 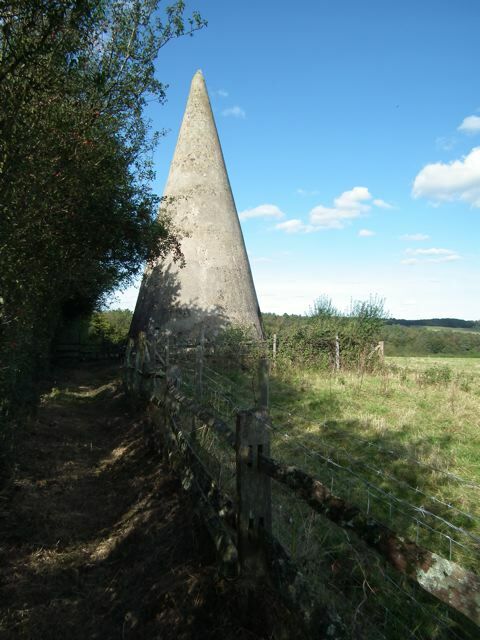 The false spire, long called the Sugar Loaf because it's exactly the shape of the conical "loaves" in which sugar was once sold, survives thanks to a repair campaign 40 or 50 years ago. Before that, it's said that someone lived inside the stone cone, although it must have been rather cramped in the brick-vaulted room inside – the whole structure is only 15 ft in diameter and 35 ft high. This is the stuff of what used to be called "English eccentricity", but there's more. Fuller was a founding member of the Royal Institution, funder of the first lighthouse at Beachy Head, and saviour of beautiful Bodiam Castle. Not so mad, then, as he might sometimes have seemed. But he did build several other eccentric buildings on his estate (there's information about them here), and when he died, his parting shot was to be entombed in a large pyramidal mausoleum in Brightling churchyard. More of that story later. 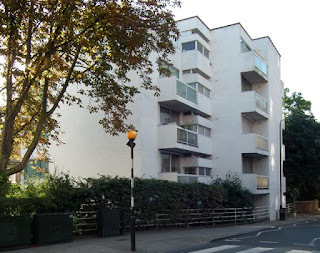 When I lived in Notting Hill I occasionally walked past this block of flats on Campden Hill Road. As one often does when passing half-familiar buildings in one's own neighbourhood, I noticed them, but did not look closely. "That modernist block of flats," I thought to myself. "How well they did things in the 1930s." 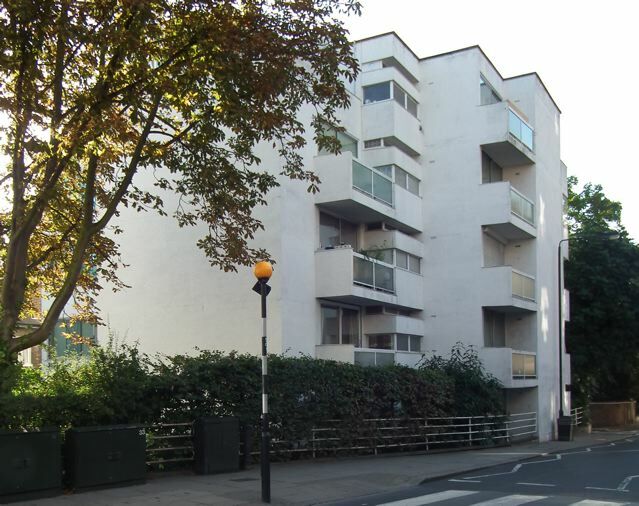 After all, many of the features of 1920s and 1930s modernism were there: the white walls, the flat roof, the long balconies, the strip windows, and the modernist arrangement of balconies, windows and stepped-back corners on one side. But this block was not built between the two world wars. It was actually put up in 1965, to designs by Douglas Stephen. In the mid-1960s, British architecture was developing in many different ways – the era gave us Brutalist multi-storey car parks, steel-framed houses, the disciplined poise of some of Denys Lasdun's work, the sculptural concrete of the Barbican. But very little quite like this, a throwback to another era: modernist revival, if you like, or the 1930s revisited, showing the influence not only of Le Corbusier's interwar villas but also of the Italian "rationalist" architects of the pre-war era (long shunned for their links with fascism). There's nothing fascist about this design though. 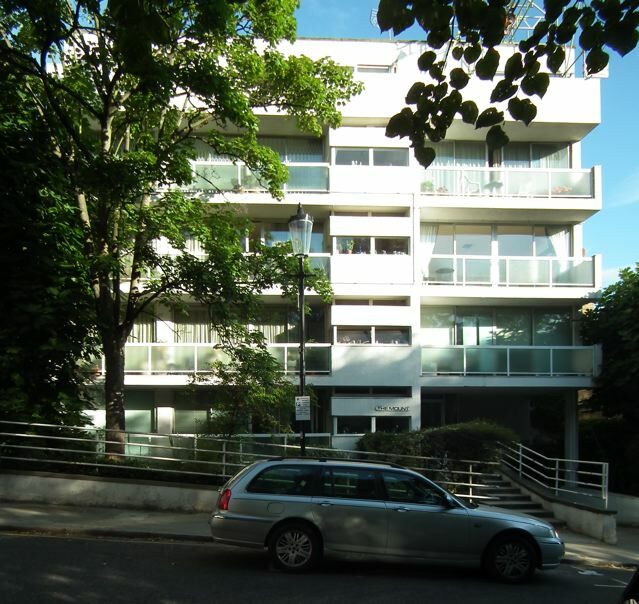 Poised on its leafy corner of west London, it represents a way of building that has endured rather well. I was admiring a neoclassical shop front near Bath's Pulteney Bridge when my eye was caught by the royal arms above the shop window. The shop has been a chemist's since 1828, but the arms are those of Queen Charlotte, consort of George III, who visited Bath in 1817, the year before she died. So they must refer to royal patronage of some earlier business based here or hereabouts. The highly complex heraldry combines the arms of the British royal family with those of her father, who was Duke of Mecklenburg-Strelitz. The amount of detail on these three-dimensional arms is staggering – all those harps, bulls' heads, fleurs de lys and so on in low relief, and the extraordinary garland of flowers around the central panel. The lion and unicorn are real characters, the former astonished, long-maned and well fanged, the latter realistically equine. 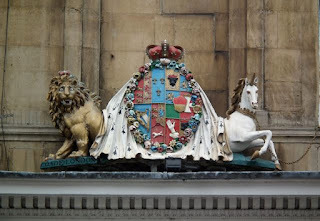 Beneath the lion, the inscription, "COADE LONDON" tell us that this coat of arms is made in Coade Stone, an artificial, stone-like ceramic material produced at Coade's Artificial Stone Manufactory in Lambeth, London. 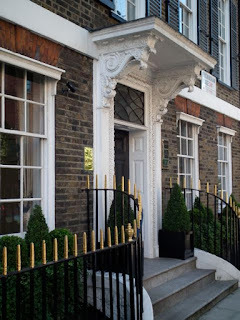 This business, founded by Eleanor Coade (always known as Mrs Coade, although she was unmarried) in around 1770. Mrs Coade developed the material, which she called Lithodipyra (from the Greek for "stone fired twice"), a ceramic composition in which flint, quartz, grog (a mix of silica, alumina, and other elements), and crushed glass were mixed with the clay. It was generally found to be hard and weather-resistant, and was easy to mould into complex shapes. These qualities made Coade stone popular for statuary and architectural ornaments between 1770 and the 1830s. Just the material, in other words, for moulding harps, lions, and tiny flowers. 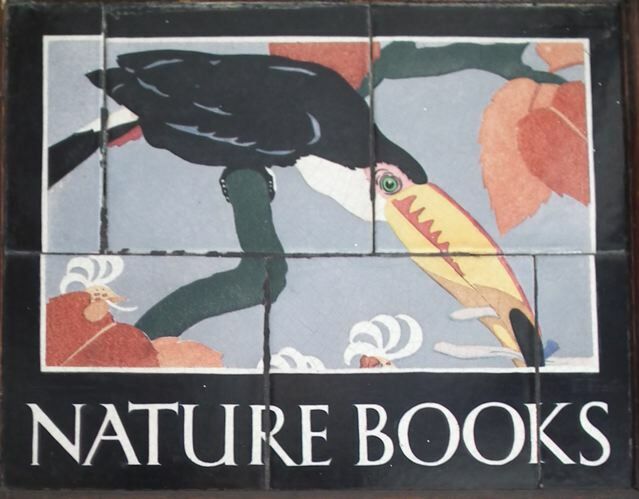 A while back I posted some decorative tile panels advertising post cards and road maps, from the front of a branch of W H Smith in Malvern. Here is one still more colourful panel, this time from a former W H Smith shop, spotted by me in Bath today. As with the Malvern panels, the tiles were made by Carter and Company and the letters were designed by Eric Gill. No doubt there were originally more panels on the Bath store, perhaps illustrating different kinds of books. Now only 'Nature books' survives on the shop facade, which now fronts a branch of Patisserie Valerie. As a reminder of the shop's previous role, this toucan, leaning down from its branch, fits the bill. Pevsner classifies the houses of Buckingham Place, in the little enclave between Buckingham Palace and Victoria Station, as neo-Georgian. 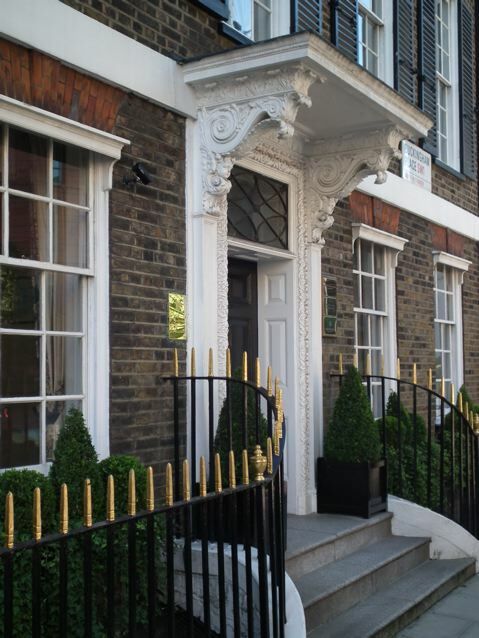 This isn't a style that normally catches my eye, but No 1 Buckingham Place, with its ornate door case, transcends the blandness of much neo-Georgian, harking back to the very beginning of the 18th century. The architect, L Stanley Crosbie, and his craftsmen really let rip with those scrolling brackets, little heads, acanthus leaves, and the rest. A storm is gathering. We hear thunder, a roar that turns into the sound of a jet engine. A Lotus 7 speeds along what looks like an airfield runway or a straight road in the middle of nowhere. The same car drives through Westminster, past the Houses of Parliament, around a corner, into an underground car park. The driver, the actor Patrick McGoohan, gets out, walks purposefully – angrily – through doors marked "WAY OUT", up a corridor, and enters an office where a man sits at a desk in front of a world map. McGoohan harangues the man (we can't hear what he says, as the theme music has now taken over the soundtrack), throws his resignation letter on to the desk, hammers the desk with his fist, and walks out. We are aware of a funereal black car following the Lotus as McGoohan drives home to No 1 Buckingham Place, where he packs his suitcase. Is he preparing to go away on holiday? The mysterious photographs he drops into the suitcase suggest something else. But we have no time to ponder this, because his pursuer from the black car pumps gas into the room, rendering him unconscious. McGoohan wakes, a prisoner, in a village by the sea. British readers of a certain age will probably realise that the sequence I'm describing comes from the opening of The Prisoner, a TV drama series that sees its protagonist – McGoohan, the secret agent who has resigned – trapped in the mysterious Village where the inhabitants are assigned numbers instead of their names. Our hero (now known as Number Six, although he rejects this dehumanizing convention) tries to escape, while also attempting to find out whether the Village is being run by his own former employers or their enemies; the authorities of the Village, meanwhile, try to pump the prisoner for information. It is all very haunting and enigmatic (and, Kafkaesque as it is, has proved so for those who grew up on the eastern side of the iron curtain as well as those in the west). For many people, the architectural interest of The Prisoner lies largely in the scenes set in the Village, which were mostly filmed in Portmeirion, the fantastic Italianate architectural ensemble on the coast of North Wales designed by Clough-Williams Ellis. But because I sometimes like to show my readers the buildings that aren't usually in the limelight, the ornate doorcase of No 1 Buckingham Place – in shot for a split-second – seemed to fit the bill. The Portmeirion village website is here. It also contains more information about The Prisoner. Some time ago I posted a curious capital from the church at Ludgershall in Buckinghamshire in which, instead of the usual plain mouldings or carvings of foliage there were figures with linked arms. I hinted in that post that there were other churches in this part of England with similar capitals – and in fact I remembered that many years ago I'd been in the grand church in Bloxham in Oxfordshire, where I remembered something along the same lines. I finally returned to Bloxham to check my memories, and this is what I found. This 14th-century capital is more ornately carved than the one at Ludgershall, but shows a similar design, with linked arms, However, the male figure also has a shield bearing a cross and the female wears a floral head-dress, is surrounded by leaves, and is being assailed by a beast of some kind. 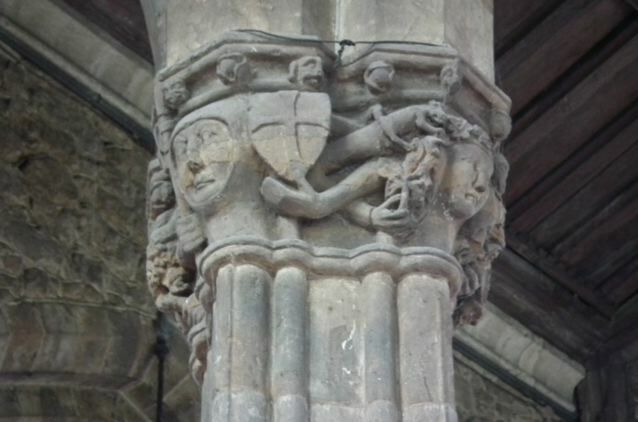 The column, with its cluster of attached shafts is highly elaborate too, and there is a further touch of ornament around the top of the capital – a band of moulding decorated with bellflowers (a favourite 14th-century motif) and tiny heads. So is the male figure, with his crossed shield and the staff weapon just visible in his right hand St George? And is the odd beast by the lady's head some provincial carver's idea of the dragon that the saint has come to slay? I don't know. As is so often the case, medieval church carving has left me pondering, but visually nourished. 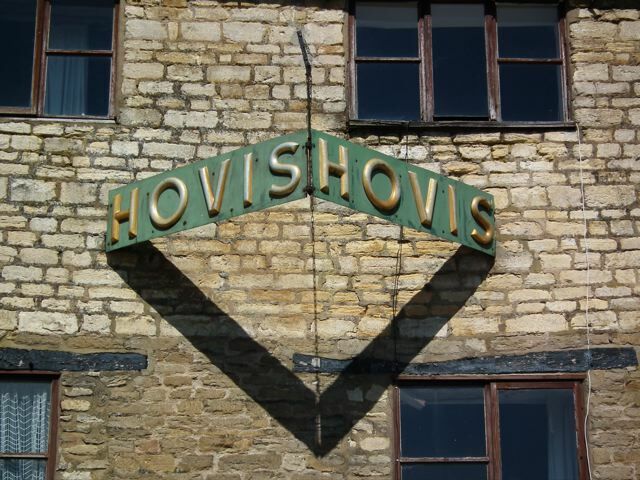 The Hovis Bread Flour Company was founded in 1898 to make wholemeal flour, and their name, a shortened form of hominis vis (Latin for 'strength of man') was chosen after a national competition. The company expanded rapidly during the early years of the 20th century and again in the 1920s after the vitamin content of wheatgerm was discovered and publicized. The expansion came in the wake of clever marketing, too. 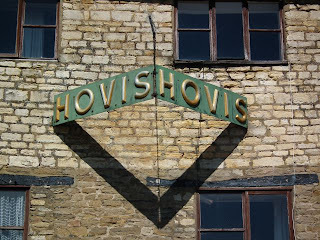 Hovis produced special tins, embossed with the company name, with which bakers could bake loaves made with their flour. They provided branded bags, boxes, and even kitchen bread bins. Wherever they went, British people were reminded of Hovis wholemeal flour. And then there were the shop signs, green, with gold letters standing out in relief. Their ingenious design ensured that they could be seen and read by passers-by coming from any direction, making them more effective than either a flat sign screwed to the wall or a hanging sign sticking out at right-angles like a pub sign. There are not so many of these signs around now, so I was pleased to find this one, attached to a building in Brackley. Hovis bread is still available and the sign is still doing its job, standing out and doing its bit to convince us that bread made with Hovis flour is outstanding. *The virtues of Hovis were imprinted on me well before the famous Ridley Scott commercial, first aired in 1973, another effective piece of marketing. In this curious confection, cobbled steep implausibly picturesque Gold Hill in Shaftesbury stands for a kind of eternal England, curiously underpinned by a speeded up brass-band arrangement ('Hurry up lads, commercial only lasts 40 seconds') of Dvořák's 9th symphony, with its Native American-influenced theme. The next in my series of postcards of buildings is the Shell House in Polperro. 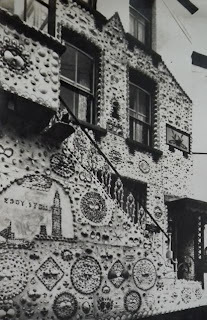 Originally a 19th-century fisherman's cottage, the building was decorated – with thousands of shells from all over the world – between 1937 and 1942 by seaman Samuel Puckey. 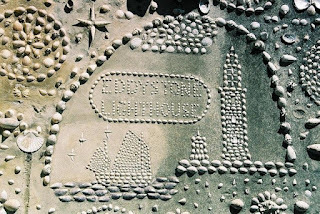 There's a long tradition of using shells in decoration – numerous country houses have shell grottoes in their gardens, and occasionally shells have been used to decorate the outsides of buildings. But this building is rather different, not the knowing jeu d'esprit of some sophisticate, but a piece of folk art, lovingly created over the years. Its decoration has been preserved and repaired in places, as the detail photograph below, more recent than my post-war postcard, shows. 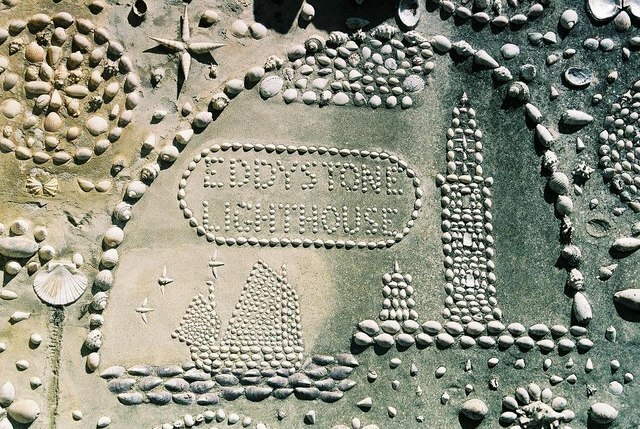 The Shell House deserves such care, and deserves too to be remembered by visitors, long after their memories of piskies and ice creams fade away. The copyright on this image is owned by Chris Downer and is licensed for reuse under the Creative Commons Attribution-ShareAlike 2.0 license. The Shell House is available as a holiday let; there are details here.